We got a closer look at Microsoft's HoloLens during Build in April, but the company is showing off the gaming aspects of its headset today. Microsoft has built a new version of Minecraft specifically for its HoloLens headset. You can play with a controller as you'd expect, and create or explore worlds using holograms you create with voice or gestures. 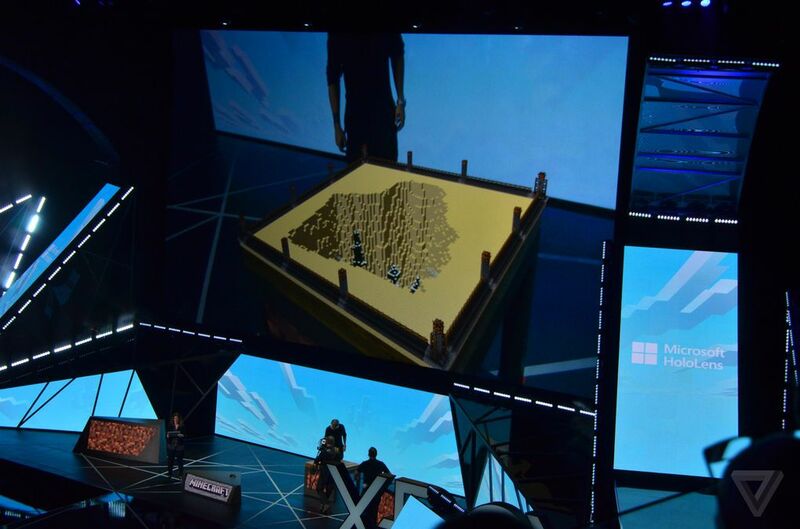 Microsoft's demonstration at E3 today involved a full Minecraft universe running on a table thanks to the HoloLens headset, and it was very similar to the experience the company revealed back in January. The audience seemed impressed, and the demo kept the hologram perfectly positioned on the table while the presenter walked around and interacted with Minecraft objects freely. Most of those interactions were enabled by voice, but the demo also involved Microsoft's “air tap” gesture where you raise your index finger and tap down. Those might not be great ways to control a game, but sitting immersed in a world of Minecraft around your living room while you avoid critters with a controller sounds like it could be a lot of fun. Microsoft is planning to share more about its Minecraft plans at Minecon in July.